Showing 33 articles from May 5, 2014. SOUTH BEND – The South Bend City Council meet for a regular meeting and quickly dispensed with $27,156.31 in city funds to cover operating cost represented in their consent agenda. A local warrant suspect, Timothy Sean Clifford, was arrested near the bank of the Willapa River after a lengthy foot chase in the downtown area of Raymond Monday afternoon. The Raymond Police Department (RPD) received a request for assistance from the Department of Corrections (DOC) in locating Clifford, 29, in the area of 124 Commercial St. in Raymond. SOUTH BEND – Former Pacific County Chief Deputy Prosecutor Mark McClain announced his candidacy for Pacific County Prosecutor. McClain is best known for the conviction of two Pacific County murder cases, including Devon Moore of South Bend and Brian Brush of Long Beach. Photo by Larry Bale Raymond HS junior Rayce Newman tied the school record in the 100-meter dash at last Thursday's meet at Naselle. Raymond romped to victory at the six-team Comet Invite last Thursday at Naselle. The Seagulls scored 179 points to easily outdistance second-place Northwest Christian (147). South Bend was third at 78, followed by Wishkah Valley (41), Naselle (39) and Pe Ell (20). 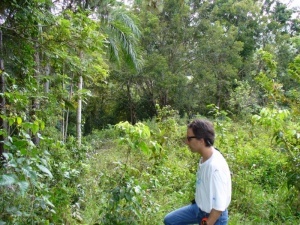 Photo Courtesy H. Rowe H Rowe at his farm in Puerto Rico. Rowe markets Puerto Rican coffee, La Esmeralda, in South Bend where he lived in his early years. SOUTH BEND – Ah! For coffee aficionados, nothing equals the smell of freshly brewed coffee – except, perhaps, the taste of it. But when it comes fresh from another country, and – what's more – from a former South Bend resident, the aroma is more than refreshing. It's intoxicating. 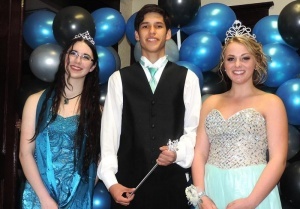 From left are South Bend HS Princess Angel Collins, Prince Tristan Hansen, and Queen Maddie Klus. Not pictured is King Zane Johnson. The area high schools celebrated prom at the Willapa Harbor Community Center in South Bend Saturday night. From left are South Bend HS Princess Angel Collins, Prince Tristan Hansen, and Queen Maddie Klus. Not pictured is King Zane Johnson. The area high schools celebrated prom at the Willapa Harbor Community Center in South Bend Saturday night. See more photos on page 3. Washington State Recreational Marijuana Retail Lottery results have come in and just released by the Washington State Liquor Control Board (WSCLB). Willapa Valley and Pe Ell high schools are giving serious consideration to joining up for three sports including football, baseball and softball. If both school boards approve it, it would take effect during the 2014-15 school year. The two schools are 22.2 miles away from each other. 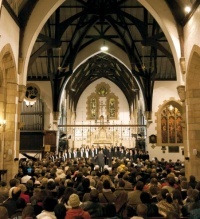 The Brigham Young University Singers incorporate moving music from a broad base of choral traditions in their expansive repertoire that impresses audiences of all ages. The superb performance abilities of this 40-voice ensemble will create a must-see concert to be performed at Centralia Community College "Corbet Theatre," Friday at 7 p.m. The BYU Singers are grounded in classic choral tradition, but extend their talents to pieces of various periods and styles. International folk songs, hymns, and moving African-American spirituals are a sampling of the genres included in the BYU Singers' repertoire. Once the concert begins, the diverse talents and professionalism of the BYU Singers is apparent. This Friday and Saturday marks Ryderwood’s Spring Craft Fair from 10 a.m. to 4 p.m. both days - another opportunity for visitors to come out to the end of SR 506. The rain might have held off only so long on Saturday, but May Day nonetheless blossomed in Vader as the community held their 62nd annual community festival. Originally thought to be a nonstarter this year due to a lack of organizers available for the event, community activists Janet Charlton stepped forward just last month to make sure the celebration could still take place. This will be my last opportunity to remind readers of this weekend’s upcoming Spring Arts & Crafts Fair in all rooms of Community Hall. That’s this Friday and Saturday, May 9 & 10, from 10 a.m. to 4 p.m. both days. A good showing of area and local artists and artisans is expected in the Auditorium and dining hall, and it will be a great place to pick up special gifts for all of the special mothers in your life. By the way, admission is free! Come early to get the best selection of baked goodies at the nearly world famous RWCS Bake Sale in the Hall’s kitchen area. It is hard to describe how delectable they are. Suffice it to say, you won’t find anything better anywhere. If you’re going to sin, you might as well have the best there is! Toledo Senior Center collecting goods for Second Time Around Sale during Cheese Days 2014. Contact diana.haug@lewiscountywa.gov or (360) 864-2112. Toledo New Life Assembly regularly-scheduled Wednesday Night Dinners resume at church, 420 Silver St. Contact office, (360) 864-4366. The Winlock Historical Museum is going to be opening for the summer beginning May 7. They will be open every Wednesday from 12 – 4:30 p.m. Winlock has had many successes and a few mishaps, such as the burning of the town. Many of you may have seen the pictures of the town are the fire, if you have not I recommend going to the Historical Museum to check it out. Winlock has a lot of history and of course I thought I would share just a bit of it with you. Gloria L. Sayler, of Gresham, Ore., died April 30, 2014. Born Jan. 24, 1927, she was 87 years old. A memorial service has been scheduled for 2 p.m. May 7 at Fir Lawn Funeral Chapel. Ray Altringer, of Toledo, died April 25, 2014. Born Oct. 16, 1918, he was 95 years old. He was preceded in death by wife Ida Williams Altringer, two sisters, son Dan Altringer, and adopted daughter Ladeva Dahlin. Sylvia Ann Wiese, of Vader, died, April 21, 2014. Born June 10, 1940, she was 73 years old. She was preceded in death by son Timothy Wiese. For the rest of the story go to www.hometowndebate.com or pick up a Herald; it's still only 75 cents; friend us at facebook. Pvt. Nathanael John Kunke was promoted last month to Pvt. 2 (E-2) while stationed at Fort Casey in South Korea. Pvt. 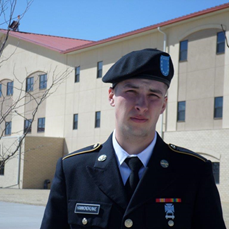 2 Kunke completed his special training as a Fire Support Specialist 13 F Class 09/10-14 while stationed at Fort Sill, Oklahoma last February. He graduated during The Teamwork Battalion Graduation Ceremony. He was trained by the 1st Battalion, 78th Field Artillery. Toledo resident Michael Messmore has declared his candidacy for the Lewis County Commission among a growing pool of hopefuls vying for Position 3. 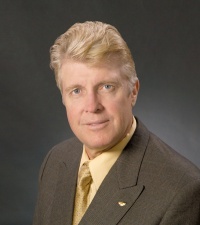 A retired pilot for Delta and Kalitta Air, the owner of Toledo-based Rio Design & Construction, and Vietnam era veteran of the Army Reserve, Messmore said he is running as an opportunity to serve the community he has called home for the last three decades. Local and state officials were present for a groundbreaking ceremony at the Toledo Sewer Plant Thursday to commemorate the construction of an upgrade that has been several years in the making. While the plant itself is not expected to be complete until mid-2015, city leaders said they are relieved to have made it to this point in the process after spending around seven years seeking out funding sources and planning to ensure the upgrade would be what the city needed. The City of Winlock has approved an agreement to lease the Community Building to the Winlock Lions Club, which became effective as of Thursday. The city and the club had been discussing the possibility of leasing the building since the end of March as city officials were exploring ways to relieve Winlock of the yearly costs required to maintain the facility. Raymond junior high eighth grader Karlee Freeman is currently the number 1 ranked discus thrower in the country in the middle school ranks based on the marks entered into Athletic.net, according to Raymond Middle School Head Track and Field Coach Mike Tully. The Willapa Valley lady Vikings won a five-team meet hosted by South Bend April 24th. Valley scored 110 points to defeat the host Lady Indians' output of 98 points. 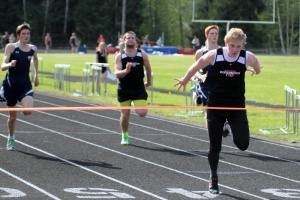 Wahkiakum was third at 53, followed by Naselle (30) and North River (14). South Bend won the boys' meet. Willapa Valley's girls won the five-team North Beach Invite by scoring 166 points to defeat the lady Hyaks of North Beach (132) last Thursday at Oyehut. Ocosta was third at 118, followed by Mary M. Knight (30) and North River (16). Police are seeking a Toledo burglary suspect after his cohort was arrested in Kelso with a large amount of suspected stolen merchandise, according to the Lewis County Sheriff’s Office. The suspect has been described as a skinny, white male last seen wearing a hat and backpack while fleeing from the scene of a burglary on the 200 block of Schmit Rd., east of Toledo, on Saturday. Authorities are seeking help solving a massive firearms theft taking place March 21 in Oalaska. It is believed, sometime between 5 a.m. and 6 p.m. March 21, an unknown number of suspects entered a residence on the 300 block of Dluhosh Rd. and stolen a 30-.30 Winchester Rifle, a 30-06 Remington Rifle, a .22 Remington Rifle, a 12 gauge Mossberg Model 800, a Point Blank bow with arrows, a Speed & Strength biker jacket, an O’Neill Motocross gear bag and $200 cash. The estimated loss is $4,340. Local fire and EMS calls between April 28 and May 4. A recent string of Honda-related thefts in Vader has yet to slow down as a fourth car has been reported stolen from the area since March. The Lewis County Sheriff’s Office reports a 1988 Honda Accord with license plate 322-ZAB was stolen sometime between 5 p.m. May 3 and 10 a.m. May 4 from the 100 block of Spring Ct., in the Enchanted Valley neighborhood. The neighbor of the victim reported her car had also been targeted by the thieves as well, but was likely not taken due to its dead battery. A 13-year-old Winlock girl has been referred for a charge of first-degree arson after allegedly admitting to starting a fire that burned down the home of one of her neighbors on Jan. 25, according to the Lewis County Sheriff’s Office. The teen said she had used matches to start the fire, which burned down a double-wide mobile home on the 100 block of Evergreen Ln. at around 1:30 a.m., stating it was not her intent to destroy the structure or cause harm to its occupants.